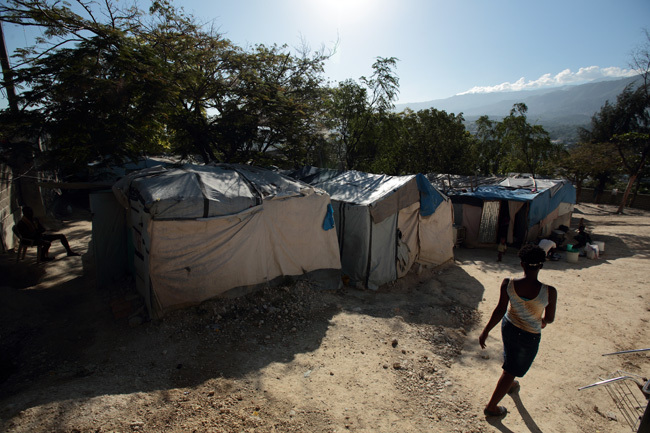 WASHINGTON (CNS) — Nearly five years after one of the most devastating earthquakes ever to rock the Western Hemisphere, more than 85,000 people still live in dozens of tent camps across Haiti’s expansive earthquake zone. The number of people who remain homeless years after the disaster points to the continuing challenges facing the hemisphere’s poorest nation. “Haitians are not just at the center of these projects, but they are leading these projects,” he said. A delegation of American church leaders planned to travel to Haiti Jan. 13-19 to attend the dedication and visit several projects: Sister Carol Keehan, a Daughter of Charity and CHA’s president and CEO; Archbishop Joseph E. Kurtz of Louisville, Kentucky, president of the U.S. Conference of Catholic Bishops; Archbishop Paul S. Coakley of Oklahoma City, CRS chairman; and Carolyn Woo, CRS president. “In the end it’s the archdiocese’s hospital. The archdiocese really sees this as a hospital that continues the tradition of a hospital for the people of Haiti,” Bruce Compton, senior director international outreach at CHA, said of the $22.7 million project. Beyond the hospital, there has been the tedious task of rebuilding Catholic churches, schools and convents under the Partnership for Church Reconstruction in Haiti, or PROCHE. Trinitarian Father Juan Molina, director of the U.S. bishops’ office on Latin America, said PROCHE has distributed nearly $20 million for reconstruction projects through October. Again, Father Molina explained, the emphasis has been on sharing responsibility between Haitian church leaders and U.S., German, Canadian and French church partners for the dozens of projects completed or underway. Haiti’s Catholic school network also has received much-needed attention since the earthquake. The University of Notre Dame’s Alliance for Catholic Education, supported by CRS, developed a plan to address the needs of students, teachers and local communities. The Haitian Catholic Education Initiative has evolved in the dioceses of Fort-Liberte, Hinche and Les Cayes and has led to opportunities for teacher training, improved school governance and greater involvement of parents, said T.J. D’Agostino, alliance associate director. Although the alliance was working in Haiti prior to the earthquake, the disaster exposed the difficulties facing Catholic schools, D’Agostino explained. With the encouragement of Haiti’s bishops, the alliance and CRS surveyed schools across the country starting in November 2011 to identify their greatest needs, he said. D’Agostino said the effort’s initial success allowed expansion into the dioceses of Jacmel, Jeremie and Anse-a-Veau and Miragoane. Ted and Katharine Oswald, a husband-wife team who share the position of policy analyst and policy coordinator for the Mennonite Central Committee in Haiti, told CNS that safe, affordable housing is one of Haiti’s greatest needs. They expressed concern about the ongoing forced evictions from tent camps as property owners seek to reclaim vacant land. “Saying 90 percent of people have vacated the camps is not a great representation of the true picture,” Ted Oswald said. Meanwhile, Haiti’s still-young democracy is fragile. Protests in late 2014 resulted in the resignation of Prime Minister Laurent Lamothe, and President Michel Martelly was addressing recommendations from a special commission he appointed to an end an impasse over elections. Clashes have erupted in Port-au-Prince between pro-government and anti-government demonstrators; the national police have responded by firing tear gas to disperse the crowds. Martelly was supposed to schedule municipal elections for 2011, but they were delayed as Haiti struggled to recover from the earthquake. Elections for a third of the Senate’s seats and the Chamber of Deputies were to have been set in 2012. Under Haiti’s constitution, if elections are not held by Jan. 12, parliament will be dissolved, allowing Martelly to rule by decree.